Georgia's #1 ranked men's golf team is dominating the field in the NCAA East Regional at Council Fire in Chattanooga. The Dawgs shot a school record 265 Thursday to take a commanding lead over the rest of the field. They shot a 271 today. Both of those rounds are better than anything any other team has put up so far. It's got to help to have Adam Mitchell (pictured) and Harris English, who both went to high school in Chattanooga, giving teammates a scouting report on the course. Evidently, it was a good report. Hudson Swafford, a Tallahassee kid, shot a 65 while Mitchell and Russell Henley shot 66s yesterday. English shot a 65 today. I'd say the golf team can go ahead and book their flight to the NCAA Finals in West Lafayette. If you want to follow the scoring online, here's the link. If you live around Chattanooga, go try to catch the Dawgs tomorrow. They tee off at 7:00 AM on the back 9. Meanwhile, the tennis team looks like the team we expected this year. They dominated Pepperdine today 4-1. None of the matches we won were reasonably close. Luis Flores played like he was healthy again, winning the three court 6-1, 6-4. The Dawgs face Ole Miss Sunday for a spot in the semifinals. Georgia beat Ole Miss earlier this year in Athens 5-2 without Flores. But don't be fooled. The Rebels are the five seed for a reason. They have four top singles players. The tennis team has had their ups and downs this year, but they still stack up pretty well against the field. If they can beat the Rebs again, #1 Virginia likely awaits. Thanks for the report on DAWG sports that I follow and love very much. We dominate year in and year out in these sports. I also love the other sports updates. 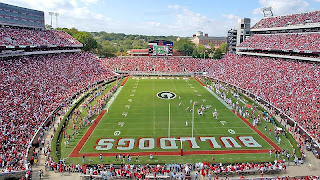 THe UGA teams are going awesome this year. Anychance we could get an update on the whole SEC Chmpion sports thing. Isn't there some sort of tracking of that. We have to be leading the pack this year. What the hell happened to the women's tennis team? How'd they get bounced so easily? I had them pegged to go much further than they did! I didn't count our Equestrian title since it's not an official SEC sport, or any tournament titles. The last titles are the Track and Field, which is this weekend.